Microsoft releases a new version of Windows Media Player about once every two years. This beta release of WMP11 both improves on features of WMP10 and bridges the gap between what we've come to expect from the current version of WMP and what we can expect to see when Vista finally ships. The biggest changes are in navigation of media, searching and the addition of more media types to the player interface. 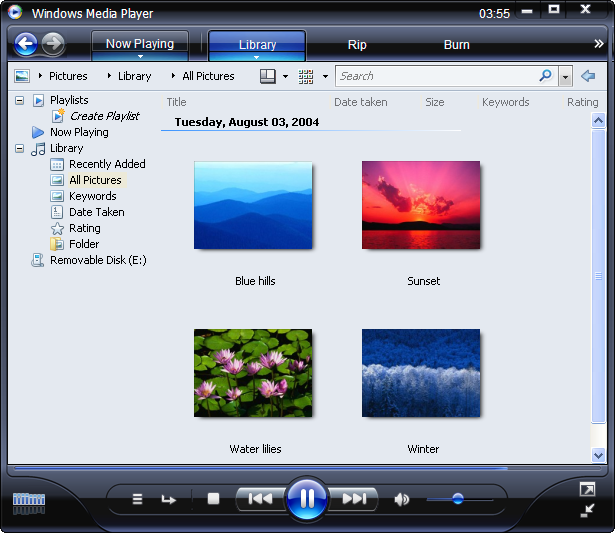 The new layout for Windows Media Player took a few visual cues from iTunes, most notably placing the playback button in the center of the application window. Sure iTunes has the buttons at the top and WMP11 places them at the bottom, but the similarities are still there. Granted there are only so many places you can put the playback buttons and centering them is likely better for usability. The biggest annoyance with button positioning is cutting off track information displayed because there isn't enough room to the left of the buttons to fit all the details unless the player is in full screen mode. Navigation across the top of the application window feels more intuitive with a series of drop down buttons, although finding things like the File menu can be tough. There was a quirk on one of my installations requiring me to verify whether the player was in offline mode from the File menu and I fumbled around until settling on using Alt+F to reveal it instead of trying to locate it via mouse. Track play time is displayed up in the corner next to the minimize button, which is easier to find than scanning the bottom. 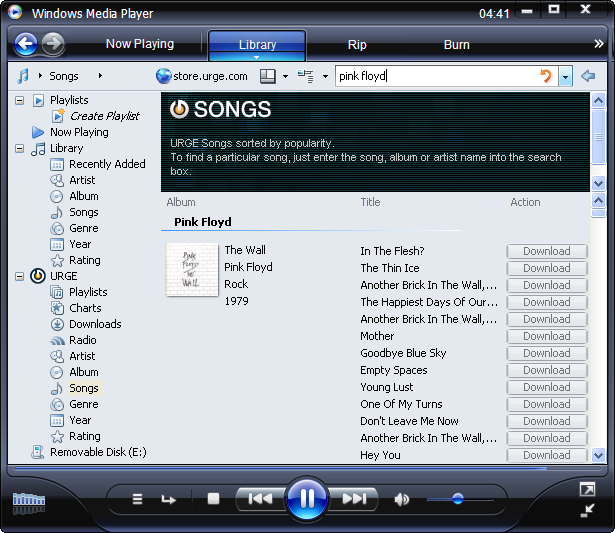 In addition to music and movies, Windows Media Player 11 now supports photo browsing from within the interface. The first time you pull in your pictures thumbnails load ridiculously slow, but after the player has gone through all your images this process works almost as quickly as browsing the song library. Video and Music are available from anywhere on your hard drive, pictures seem to be limited to the My Pictures folder (which is either an oversight or the easiest way to avoid having album art pollute the results). The photo feature appears to be limited to browsing in the beta, as editing tag info isn't supported and you can't rename any of the photos. We'll see what the final release brings, but this is a little half-baked at this point. Search is dramatically enhanced with as-you-type result sets. WMP11 narrows your search on the fly based on what you type in the search box. iTunes had this functionality several versions ago, but Windows Media Player takes it too a new level by making the search blazing fast, even while viewing album art. Depending on which view of the player you start in, this might be across artists, albums or individual songs or within a subset of a particular artist or album. 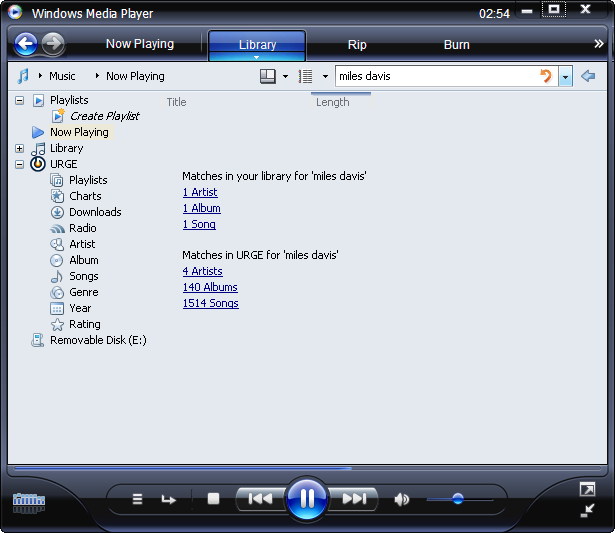 I have a few Windows Media Player search tips to make finding what you're looking for easier. One cool trick is performing a search and leaving out an entire genre from the results, so if you want to look for songs with the word "cry" in the title but don't want any Country songs, you simply type cry NOT Genre:Rap to filter results in a targeted way. This improved search comes at the price of the player using more memory, but if your machine has at least 1GB of RAM (which it should) you won't notice any performance difference. Here's another feature that needs further optimization before final release. iTunes Music Store is the benchmark by which all online music stores are judged. With the launch of Windows Media Player 11 comes the new MTV URGE service, which is powered by Microsoft's Windows Media DRM and what seems to be the most robust backend in online music stores. The store supports both per-song purchases and the monthly subscription model we've seen from Napster and Yahoo. I setup the 14-day trial account with URGE and will likely sign up for the service when my trial expires because it works better than any other store at this point. One immediate differentiator is the sign in process actually works and doesn't time out the way Napster seems to do with great frequency. After creating an account, I started browsing tracks and got instant gratification in playing back any song or search result set of songs. Search functions in Windows Media Player 11 will indicate available tracks across both your local music library and across the entire database of MTV URGE, basically extending your personal library to include the entire universe of digital music, which is a great experience if you have the sudden impulse to hear a track from some faded memory. All of this adds up to something stronger than the iTMS experience because you're not limited to 30-second previews and 99-cent downloads of songs you only want to hear for a fleeting moment, and you're not restricted by drive storage because you've got MTV storing a massive online catalog for you. Don't be confused by the MTV association, there's plenty of music for everyone. For instance, T-Bone Burnett, the guy behind many of the original tracks on Oh Brother Where Art Thou, has a new release prominently featured in the player as well as the latest from Buena Vista Social Club. If you browse by genre, the interface provides total potential listening hours, which translates to almost 10,000 hours for classical and 15,000 for jazz, in addition to the 30,000 hours of Rock. The "I don't own it" argument doesn't hold water in my view because an always on subscription means you get both the albums your budget would afford you to purchase if you were buying CDs per album and the universe of music you might like to taste but can't because your disposable income creates a barrier to entry. Paying to listen to any song you want at any moment in time, whether it's the latest disposable pop star or a classic Miles Davis record. For me a subscription service is like having IMDB to track down movie stars - if someone tells me about music I can listen to it and understand what they are saying. There are still a few quirks, like browsing the Billboard charts and getting a 30-second preview of songs instead of the whole track when signed in, but URGE already offers faster performance than any other store, including iTMS. Depending on which view you're in, it can be hard to tell whether files downloaded or not. The only other case against URGE is lack of support for iPods. Even in beta, Windows Media Player 11 is already ahead of previous versions. The music stores actually work the way you expect them to. Navigation makes more sense. Searching your music library is actually a joy, with visual searching making it faster to find exactly what you're looking for. There are moments when the interface lags in response to your clicks, features like photo browsing seem half-baked in their current form, but like previous versions of the player, there's still time for changes before the final version ships. I'm running the beta build on my primary machine and have no plans to revert back to WMP10 because I want the MTV URGE service and I like the search features. 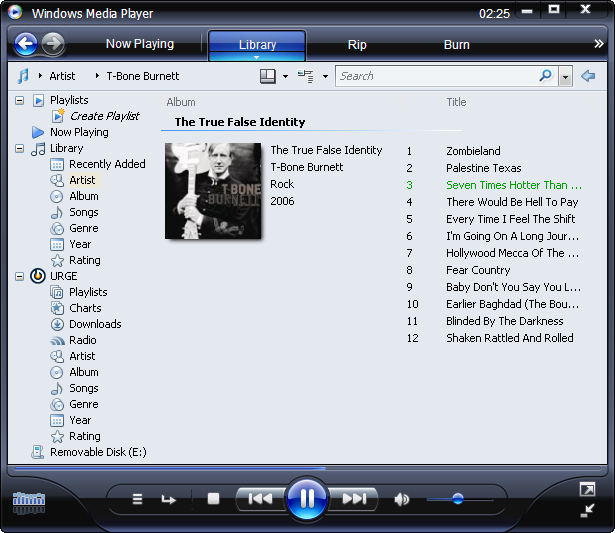 Even in beta this is by far the best version of Windows Media Player to date.